I know, I know, it’s still red and pink month. But what’s a woman to do? This is a clapotis, of course. I’m not very far along yet (I just dropped the first little row of stitches), but I can’t help myself. My red socks will be there when I return from the land of KTBL and PFB. This yarn, which I wrote about the other day, is over-the-moon amazing. I am besotted. I do believe Sundara must get it from Yarn Fairies. Your Sunny Day Clapotis is really beautiful. I have made a few tangents myself, but have rationalised it by telling myself, it’s not like the Olympics, and as long as I finish one red or pink thing by the end of the month, I’m cool.Are you buying it too? 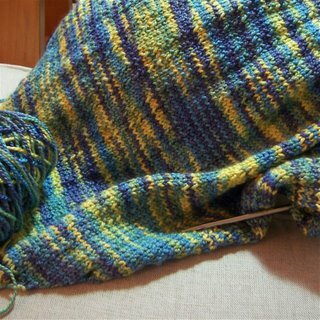 Ok, now I have to go look at that yarn you are using for Clapotis – fabulous! It may not be red or pink, but it certainly screams spring to me! Clapotis reminds me of forget me nots, which is a good thing, really!